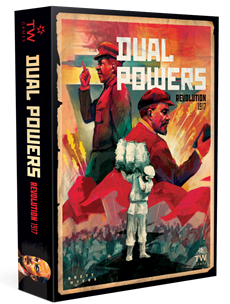 Spark a social revolution during times of Russia's internal struggle in Dual Powers: Revolution 1917 - a new area control game by Thunderworks Games. In Dual Powers players direct the forces on one side of this struggle through political action, social maneuvering, and military conflict. The player with greater support at the end of the game will shape Russia’s future and either launch or suppress the impending Civil War.